Romano-Egyptian leonine gold ring, circa 1st century BC. The British Museum's eagerly awaited new Exhibition 'Life and Death in Pompeii and Herculaneum' will be opening on 28th March. With more than 34,000 visits booked three weeks before the opening this is a once in a lifetime chance to gain a fascinating insight into daily life at the heart of the Roman Empire, and some of the top exhibits are items of jewellery worn by the people of these cities at the time of the eruption - one of the most impressive exhibits being a gold snake bracelet made of solid gold. In celebration of this exhibition we will be highlighting a few selected pieces from our extensive collection of Roman jewellery. In Roman times to be adorned in gold from head to toe was a sign of the very highest status. Images of real and fantastic animals were of widespread popularity in jewellery design, and indeed one of the highlights or our current collection of genuine Roman rings at Berganza is a gold lion ring made during the 1st century BC. Finger rings were the most popular type of jewellery worn during the Roman period and were worn by men, women and children. Most male finger rings had a function to perform. These were signet rings used as a form of royal insignia by higher-ranking officials. Ladies rings however were used solely as decoration and were ornately carved in precious metals or gem set with garnets, cornelians, agates and jasper. 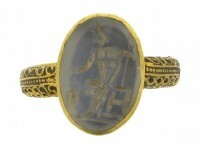 A significant signet ring in our collection is a grey chalcedony ring dating from the 2nd century AD. The ornate gold ring is set with an intaglio, or engraved gemstone, carved with a full-length figure of the Greek god Zeus, seated on his throne and holding a sceptre. Zeus was god of the sky and ruler of the Olympian gods, and we can only imagine that the original owner of this ring was an important man of the highest rank in Roman society. The shank of the ring is ornately decorated with filigree, a fine gold wire that was finely manipulated by bending and soldering to form the most intricate of designs, popular amongst those who could afford it to show off their wealth and status. Gemstone engraving was an important art form in Roman times, and due to the hardness of the stones was something only the most skilled and specialist craftsmen could achieve. The designs would often take months to be cut into the stone using abrasive powder ground from an even harder material. The complexity of the image was important in ensuring the seal could not be copied. Earrings were commonly worn by women at the time and there were many different styles and types. Towards the end of the Roman period the custom became popular of making patterns in sheet-gold by cutting out portions of the metal with a chisel. This process came in to use in the second century AD was popular for necklaces, however we have in our collection a pair of earrings that were handcrafted in the 3rd century AD using this technique. Composed of a square sheet of gold pierced with squares and triangles producing a geometric lace-like pattern, each earring is centrally set with a cobalt blue spherical glass bead, attached by fine gold wire in a method typical of the period. As Roman jewellery was made chiefly out of gold, many decorative processes were available to the goldsmith. Some of the most ornate processes were filigree and granulation work. These closely related processes are for decorating goldwork by the application of wires and grains of gold. Filigree consists of fine gold wires which are soldered in patterns on a background. Our ancient Roman gold pendant is one such example and consists of a drop-shaped solid gold plaque set with an intricate pattern of scrolled, twisted and plaited gold wire. These are just a few of the ancient techniques that were used to create a rich variety of styles in Roman jewellery. This extraordinary jewellery that has survived almost 2000 years has not only endured through the preservation of museums. It has also endured due to the pleasure and enjoyment gained from wearing such a significant piece of history and craftsmanship. This jewellery was made to be worn and enjoyed in Roman times but has lasted through millennia, and the incredible part of this? It can still be worn and enjoyed by us today. Ancient Roman Syrian garnet and gold ring, 3rd century AD.